Securities, Takumi Otsuka. Minyak sedikit menguat di awal perdagangan. “Sentimen masih sangat bearish terkait kondisi perekonomian di Eropa dan AS yang lemah,” tambahnya. “Fokus pasar pada data perekonomian AS pekan ini.” Angka pengangguran dirilis hari ini dan nonfarm payrolls dirilis besok (05/08), kedua data sangat berpengaruh pada pasar. USD menguat setelah BoJ melakukan intervensi ke dalam pasar mata uang. Hal ini turut menekan minyak meski berdampak kecil dan hanya sesaat, kata Otsuka. Minyak Nymex bulan September naik 21 sen menjadi $92.14/barrel, Minyak ICE bulan September naik 2 sen menjadi $113.25/barrel. 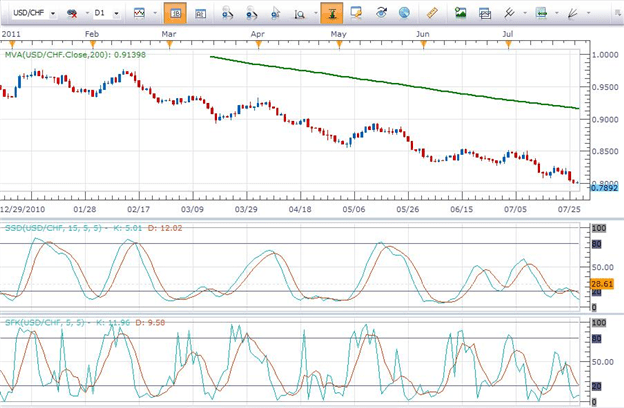 One of the most widely used indicators is Stochastics. A question that is oftentimes asked in our live sessions is what is the difference between Slow and Fast Stochastics. Below is a Daily chart of the USDCHF with both a Slow and Fast Stochastic indicator on it…Slow Stochastics above and Fast Stochastics below. In principle, the trading rules are the same…a cross above 80 with a close below 80 indicates that momentum on the pair is bearish…to the downside. Conversely, a cross below 20 with a close above 20 indicates bullish momentum.We would advocate the use of the Slow Stochastics from the standpoint that it is more “readable” since it does not react as dramatically to each price action movement, be it major or minor, that the pair may have. As can be seen on the chart below, Fast Stochastics is much more sensitive to price action and, as such, is often used by shorter term traders.Keep in mind that oscillators such as Stochastics will not “predict” trends. Rather they indicate momentum based on price action. A trader will identify the trend on the Daily chart and then use an oscillator like Stochastics to time their entry in the direction of the trend on the Daily chart when momentum is shown as being in that direction.So if the daily trend on a pair is bearish as it is on this USDCHF pair, a trader using Stochastics to enter the trade, would enter a short position when Stochastics had been above 80 and then closed below 80. Richard contributes to the Instructor Trading Tips articles. If you look at the chart, Gold has been rallying from $681/troy ounce (October2008) to $1609 (yesterday high) and it could test a higher level in days. I was trying to draw a line or a pattern, but I could not find the proper one, because the price is breaking up higher and higher. I could only draw Fibonacci Projection which the result is around 1632-1635. Warren Buffett said, when you buy a stock, you become a partner of manic depressive fellow, Mr Market. Each day Mr. Market runs up and offers either to buy you out of business or to sell you his share. Most of the time you should ignore him because Mr. Market is very psychotic. There is time when he become so deppresed that he offers you his share for a song, and that ‘s when you should buy. At other times he becomes so manic that offers an insane price for your share, that’s when you should sell. The idea is very brilliant but it is hard to implement.Why? because Mr Market’s mood is so contagious. Most people want to sell when Mr. Market is depressed and buy when he is manic. It is still in my mind what my mum said.”……..cause everyone else is buying”. It sounded like an alarm to me. Note that it ‘s not only happening to my family or to my office, but it is happening everywhere! Everybody at anyplace knows that investing Gold is good now. Do you still remember this financial proverb? Buying when everyone else is selling, and selling when everyone else is buying. Are we entering this zone already? we will see in coming months. All things considered, Thursday’s session of trade was relatively uneventful from a price action standpoint, with markets in the end, closing near their daily opening levels. The Greenback had initially been weighed down across the board on concerns over a potential downgrade to US credit ratings, but managed to fight its way back in the latter half of the day, with US economic data coming in as expected and more importantly, Fed Chair Bernanke throwing cold water on any real hopes for further accommodation from the Fed. Looking ahead, the European economic calendar is extremely quiet, with the only key release coming in the form of the Eurozone trade balance. But as was the case on Thursday, the quiet economic calendar for the session should be a welcome development as broader global macro forces are at play. US equity futures and oil prices consolidate their latest declines, while gold sits on the opposite end of the spectrum and consolidates gains by record highs. EUR/USD: Overall, price action remains quite bearish and we continue to like the idea of selling into rallies in anticipation of a more sizeable pullback below the 200-Day SMA. 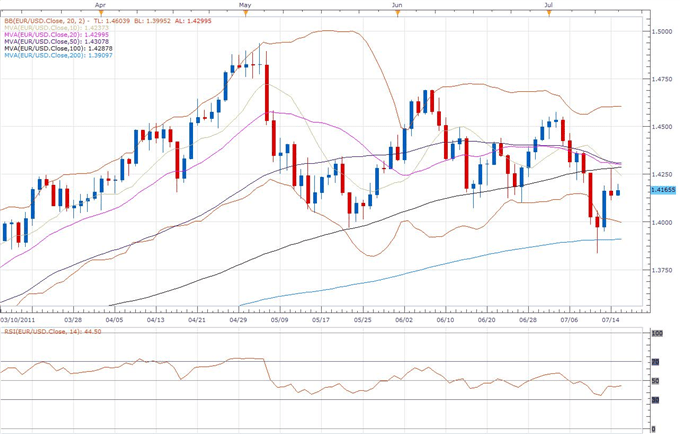 The longer-term moving average resides by the 1.3900 figure and a clear break below will open the door for a test of next key support in the 1.3750. 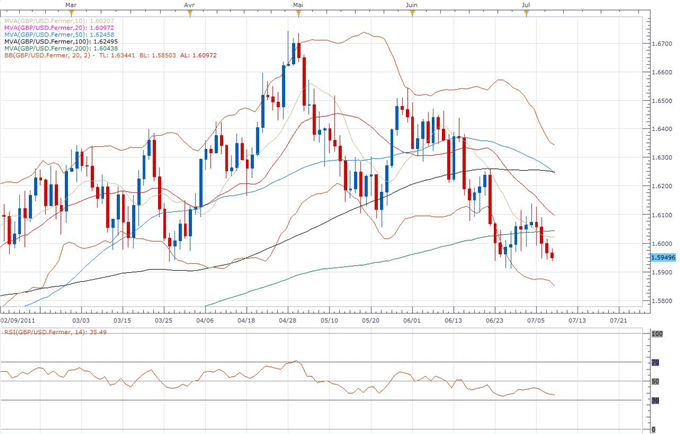 In the interim, look for the formation of a fresh lower top somewhere ahead of 1.4400. Thursday’s topside failure by a convergence of moving averages just under 1.4300 could very well offer itself as a strong candidate for this next lower top. USD/JPY: The latest daily close below 79.50 certainly compromises our constructive outlook with the market breaking down below some solid multi-day range support in the 80.00 area and dropping into the 78.00’s thus far. This now puts the pressure back on the downside and opens the door for a retest and potential break below the record lows from March by 76.30. At this point, a daily close back above 80.00 would be required at minimum to relieve downside pressures. GBP/USD: We classify the latest price action as some consolidation ahead of the next major downside extension with the market now looking to establish back below the 200-Day SMA and extend declines through next key support at 1.5750 further down. 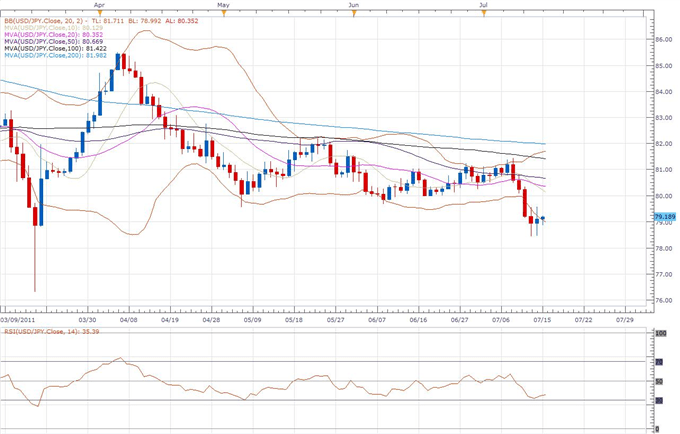 In the interim, look for any rallies to be well capped ahead below 1.6250 on a daily close basis. Back under 1.6000 helps to confirm and should accelerate. USD/CHF: Despite the intense downtrend resulting in recently established fresh record lows below 0.8100, short/medium/longer-term technical studies are looking quite stretched to us, and we continue to like the idea of taking shots at buying in anticipation of a major base. Aggressive bulls may want to look to establish fresh long positions ahead of 0.8000, while conservative counter-trenders will want to wait for a daily close back above 0.8200 at a minimum. to support a rate hike. The opposite stands for a deteriorating outlook. The dollar has put in for a dramatic reversal this past week as the primary points of appeal for the currency have taken a clear blow. Up until Wednesday, the greenback managed a remarkable rally that guided the benchmark EURUSD pair to a decline that topped 740 points. However, the currency’s performance with this particular exchange rate was not replicated across its other liquid counterparts. What does this say about the dollar – that its strength was not uniquely derived from its own fundamental backdrop; rather this dramatic charge was leveraged by the weakness of its counterpart. Considering the Euro / US dollar exchange rate is the most liquid currency pair in the FX market by a wide margin; it should come as no surprise that evidence of a worsening sovereign debt crisis in the Euro Zone readily contributed to the greenback’s safe haven appeal. Yet, this primary role for the currency was significantly diminished by the commentary from Fed Chairman Ben Bernanke that further stimulus may be pursued and a warning from Moody’s that it was putting the United States’ top sovereign credit rating on review. Yet, while the market reacted to both developments with fervor; neither headline was off the markets radar. Not long ago, Standard & Poor’s warned the US could face a downgrade and the central banker offered possible scenarios for both tightening and loosening policy. That being the case, should we expect dollar to sustain its dive? The stability of the US and global financial markets is an immediate and real concern. In the past few weeks, we have seen demand (measured through cost) for liquidity rise to multi-month highs. This call for short-term funds finds much of its genesis in the European debt crisis. With market access problems spreading from Greece to Portugal, Ireland and even Spain and Italy; we are facing a clear deterioration in funding conditions for one of the biggest collective markets in the world. A far greater threat however is the possibility of a US downgrade. With the government facing an August 2nd deadline to lift the debt ceiling or face a technical default; the market is looking down the barrel of a proverbial gun. Nearly every asset in the world is priced on Treasury’s risk free rate. There is general consensus that the US and global economies are cooling after their strong post-recession recovery. However, that doesn’t mean that market sentiment is pricing in this reality. This past Friday, the market was delivered a clear shock when the Labor Department reported that June nonfarm payrolls rose a sparse 18,000 positions – a wide miss on expectations and the smallest increase in nine months. The details were even more sobering with participation at a quarter-century low, the average duration of unemployment at a record high and those that want a job but were forced out the market hitting a record as well. What is truly remarkable is that the stubbornly high level of unemployment contradicts the efficacy of the government and Fed’s stimulus efforts. This is the source of the anti-QE3 argument. 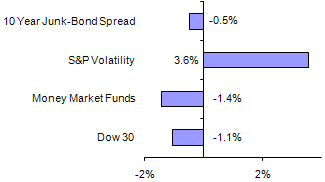 Volatility is more remarkable for the capital markets than direction. Over the past few weeks we have seen a dramatic rally for the benchmarks for investor-favored asset classes shift to sharp declines. The initial run up found little in the way of tangible fundamental support; but the efforts of European officials towards solving their financial situation and rumors of further stimulus from the US certainly offered a base for bullish speculation. The turning point for the US markets was the disappointing employment report. Though this is just one indicator for the world’s largest economy, it represents the largest single economic catalyst in the world and it happens to be one of the primary targets of the Federal Reserve’s policy decisions. As the EU sovereign contagion spreads further and headlines of fallout from a US downgrade overwhelm investors; sentiment will maintain a dovish bearing. However, there is another factor that could offer a short-term reversal – or just as readily exacerbate fears: the US 2Q earnings season. The action begins this week with JPMorgan, Citi and Google on the docket. The following week is far denser with its releases; but we should keep a broader view of the results. If overall earnings growth is slowing; it will undermine the increasingly fragile sense of risk appetite that has kept equities near highs. For the capital markets benchmarks, we see in price a lack of conviction but a sure sign of uncertainty. The S&P 500 and Dow Jones Industrial Average attempted a strong run to overtake three-year highs through the end of June and into the beginning of July; but the implications of setting new highs were greater than the market was willing to approve. Having pulled back sharply from this short-term cycle high; it is clear that speculative is increasingly prevalent without a commensurate participation from investors who are willing to stick with trends. One interesting factor is the gradual increase in volume that will support a prevailing trend. Where we have lacked for consistent trends, we have certainly made up for it in sheer volatility. The traditional readings using implied volatility figures through options have hardly budged. That said, price action has shown a remarkable increase in activity (measured through increased tick volume as well as wider daily ranges – not to mention dramatic turns in market bearings). Once again, we have to point out the short fall in the usual volatility readings – they are based on ‘insurance premiums’ that reflect the market’s fears. Expectations for maintaining and expanding stimulus, ongoing earnings growth and unrelenting economic growth has left the market with unrealistic projections and a book of excessive risk. 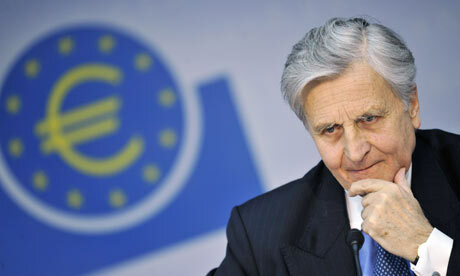 Euro Sovereign Debt Crisis Further Deteriorates, So Why the Bounce? If the dollar (ticker = USDollar) were in charge of its own fortunes, it wouldn’t have suffered the sharp reversal the market impressed through the European and US trading hours Tuesday. The price action through the previous trading day reminds us that the greenback is at the mercy of larger fundamental themes; and the currency will continue to find its bearings through these strong market winds through the foreseeable future. Tracking following the now-familiar correlations, the high level of market volatility made even easier to spot the dollar’s reflection of risk appetite trends. Our favored benchmark for sentiment trends, S&P 500 futures, managed to break the most aggressive decline in over a month with a sharp, bullish recover before New York liquidity came online. The unusually active overnight session lined up perfectly with EURUSD, pulling the currency back up to the important 1.40 figure that signaled progress on the pair’s bearish progress the session before. Now, with the benchmark exchange rate resting once again at this critical figure; the debate over direction and momentum are once again the responsibility of speculators. From the fundamental side of the equation, market sentiment was guided by the preoccupation with the European sovereign debt situation – hence the intraday reversal. With Ireland finding itself sovereign debt rating lowered to ‘junk’ status (more on that below), the situation has tangibly deteriorated; but the speculative spirit would respond quickly to the quick fix offered in rumors of ECB purchases of EU member bonds. This temporary relief would turn a quick profit taking on risk-aversion position; and lead market participants to wait for the next catalyst for direction. For scheduled event risk, data did little to encourage risk trends or the US recovery. The May trade deficit swelled much more than expected to a $50.2 billion shortfall while the NFIB reported an unexpected slip in small business confidence (the group responsible for the greatest segment of employment in the country). Most notable, though, was the minutes from the FOMC decision. This looked like a write-off event after Chairman Bernanke’s press conference following the decision; but the notes proved noteworthy. On one hand, a few members spoke to the need for further stimulus should growth not curb unemployment; but there was also a consensus on the “steps” for stimulus withdrawal. 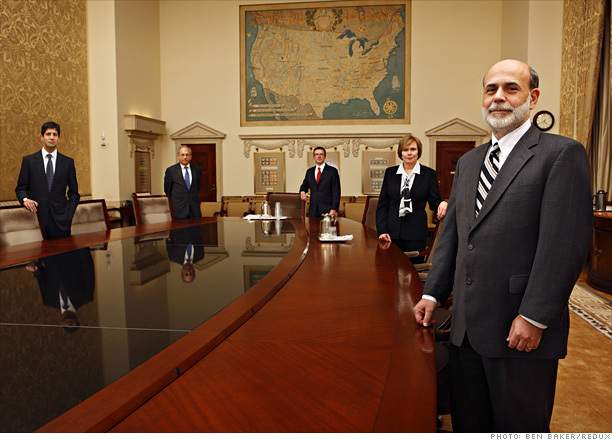 Perhaps this mixed view will come up in Bernanke’s testimony in the upcoming New York session. The central banker is scheduled to deliver his semi-annual policy report to Congress; and politicians have better access to grill than the regular market participant. Given the discussions circulating in headlines and amongst trading forums, there is considerable speculation of a QE3 announcement. That is unlikely given the steady progress of policy to this point and the trouble with eventually drawing down a larger safety net. Then again, anything is possible nowadays. Having plunged in the previous two active trading sessions (and fallen over 500 points in the span of 5 days against the greenback), the euro was due for a correction. The initial tumble Tuesday morning was largely influenced by prevailing market concerns; but some credit should be given to comments offered by new IMF head Lagarde. The real buying momentum for the day, however, falls to rumors that the ECB purchased Italian and Spanish sovereign bonds after their dramatic selloff the previous day. A bid from the policy officials is a well-known temporary fix; but the hold over form this effort is certainly in question after Moody’s downgraded Ireland’s credit rating to ‘Junk’ and pegged it with a negative outlook. The immediate impact was muted; but this was the same general reaction to the Portugal incident the previous week. We now have two countries whose debt will have to be purged by high quality portfolios and a crisis spreading to the EU core. Temporary fixes won’t cut it. 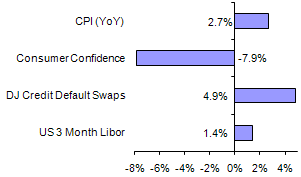 Between bullish and bearish scenarios for the UK CPI data; the latter had the greater potential for impact. That said, a notable slip from the headline reading to 4.2 percent clip wouldn’t rouse much of a reaction from the sterling. This reflects a complete lack of interest in rate speculation. Alternatively, the jobs figures could tap into concerns over the impact of austerity efforts on growth and perk up volatility. Business and consumer confidence data populated the Australian docket Tuesday and Wednesday respectively; but its influence over the market was notable anemic. Those trading the high-yield currency are more concerned with larger risk trends and longer-term economic trends. That said, a 2Q GDP reading from China (the slowest since 3Q 2009 but still 9.5 percent) didn’t seem to alter carry interests much. 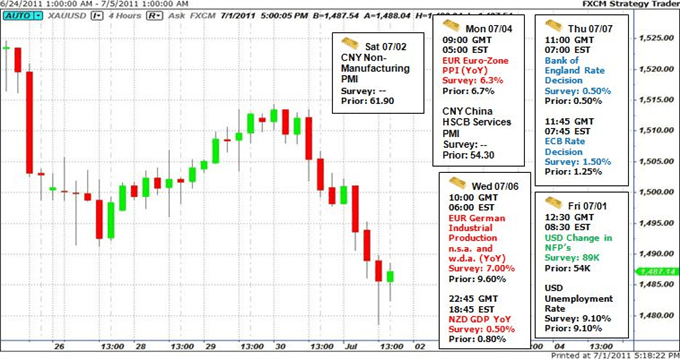 Last week, the market was preparing for the release of 1Q GDP figures from New Zealand; but the statistics group decided to push the data’s release back. Now, we are once again in the countdown to the release and expectations of a 0.3 percent increase in growth reflect a decent performance for the country. Yet, for a currency that has rallied on flimsy fundamentals; a disappointment can push the tipping point. The Bank of Japan boosted its outlook for the economy for the second month with the commentary from its policy decision; but the downgrade to year-end 2012 GDP forecasts hung heavy. 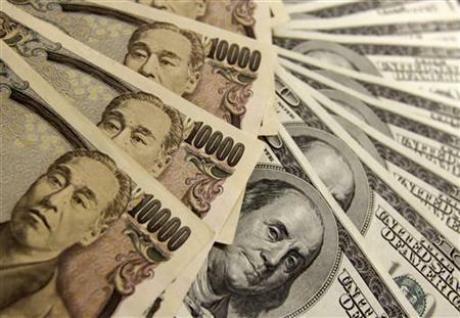 Yet, yen traders know that generated little interest for the currency. Wednesday morning, a big flush after the session rollover would expose low liquidity and spark a sharp rally. But without carry unwinding to back it up, it was quickly retraced. With Bernanke on tap tomorrow, the US 2Q earnings season starting soon, the budget ceiling countdown running, Ireland downgraded to ‘junk’ status, and the Portuguese central bank downgrading growth forecasts; there is plenty of reason to avoid exposure to the largest economies and their troubled markets. What are the viable alternatives to something as familiar and liquid as currencies: gold is at the top of the short list. Risk correlated currencies and other assets continue to do a good job of absorbing bad news, while at the same time rallying impressively on any sign of light. The rebound in these markets on Thursday have been primarily driven by two developments, the first of which, an uncompromising and unwavering ECB which remains intent on continuing with its newly adopted tightening bias, even in the face of ongoing peripheral debt concerns. The second driver of the risk rally has come from some solid ADP employment data which now encourages optimism for a healthy number out from tomorrow’s more highly anticipated US NFP report. Our colleague, the chief strategist at a major US bank sent out a very interesting chart that illustrates this anomaly in which risk correlated currencies continue to benefit despite some broader negative news. 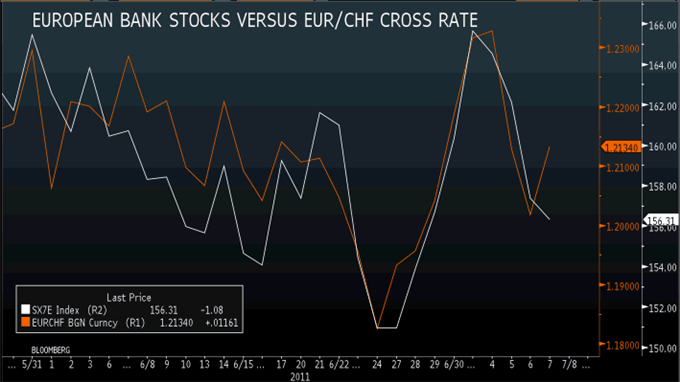 While European bank stocks have come under some solid pressure over the past few sessions as uncertainty on the Eurozone peripheral escalates, the Eur/Chf cross which normally would also trade lower on this news, has in fact rallied, to reflect a carefree (ore less concerned) attitude towards Eurozone debt risks (see below). Our colleague suggests that whatever is being discussed in terms of a resolution in the Eurozone could be overall peripheral friendly but not necessarily European bank friendly. Moving on, earlier in the week we discussed the possibility that solid US economic data could start to translate into a stronger US Dollar, with the Fed having nowhere to go with monetary policy but up. But at this point, it seems as though market participants are not yet ready to buy into that correlation shift, with the preference still to move away from the Greenback and into higher yielding currencies on any positive US economic data. While it is true that Fed policy can only go up from here, it seems as though investors feel that failure to move at all still offers more attractive yield differentials abroad. We certainly can’t argue with this view, but also at the same time would be looking for that correlation shift over the near-term. For now however, the USD bears are winning out on this argument and the latest less than hawkish official speak from the always hawkish Fed’s Fisher and Fed Hoenig is not helping the buck’s cause. Looking ahead, Swiss unemployment, German current account and trade, and UK producer prices will be the key economic releases in the European session, while into North America, US and Canada employment reports will take center stage. US equity futures and commodities prices consolidate their latest moves and track relatively unchanged into the European open. As a side note, it will be worth tracking performance in the New Zealand Dollar on Friday, with Nzd/Usd back above 0.8300 and breaking to fresh post-float record highs. We continue to view the market as stretched and do not see gains sustaining above the figure. As such, selling on any rallies above 0.8300 cold rove to be a rewarding strategy. EUR/USD: Overall, medium-term price action remains quite choppy and we continue to like the idea of selling into rallies in anticipation of a more sizeable pullback below 1.4000. From here, look for the formation of a fresh lower top by 1.4580 ahead of the next downside extension to be confirmed on a break back below 1.3970 over the coming days. In the interim, look for intraday rallies to be well offered ahead of 1.4500. Back under 1.4220 accelerates declines. USD/JPY: After undergoing a fairly intense drop off from the 85.50 area several days back, the market looks to have finally found some support in the 80.00 area and could be in the process of carving out some form of a base. Look for setbacks to continue to be well supported around 80.00 with only a close back below 79.50 to give reason for concern. From here we see the risks for a fresh upside extension back towards the recent range highs at 85.50 over the coming weeks and the latest break and close back above 81.00 helps to confirm. Look for a test of next key short-term resistance by 82.20 over the coming sessions. 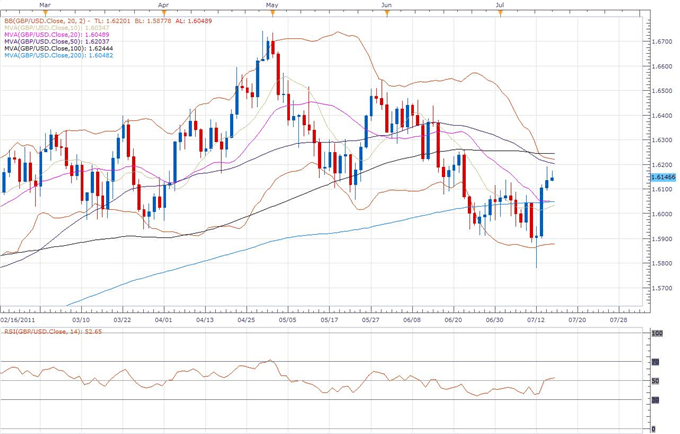 GBP/USD: Although the short-term structure remains bearish, setbacks seem to be well supported in the 1.5900’s for now. However, we classify the latest price action as some bearish consolidation ahead of the next major downside extension with the market now looking to establish back below the 200-Day SMA and extend declines below next key support at 1.5750 further down. 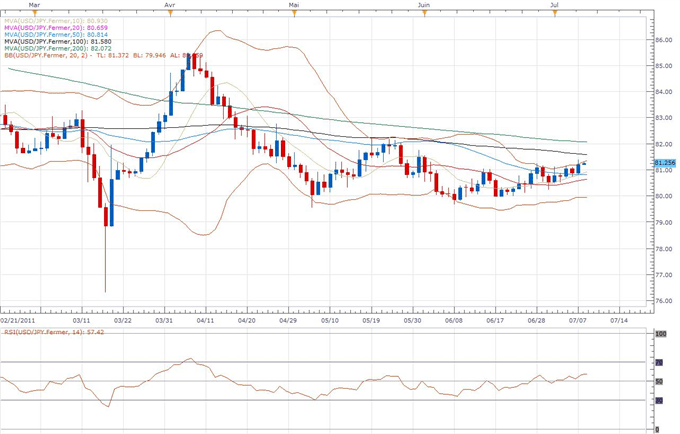 In the interim, look for any rallies to be well capped ahead below 1.6150 on a daily close basis. 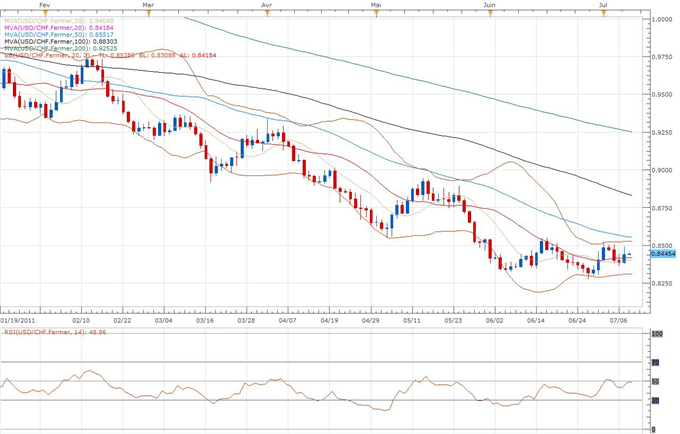 USD/CHF: Despite the intense downtrend resulting in recently established fresh record lows below 0.8300, short/medium/longer-term technical studies are looking quite stretched to us, and we continue to like the idea of taking shots at buying in anticipation of a major base. The latest break back above the 20-Day SMA is encouraging while a push beyond 0.8550 will ultimately be required to officially relieve immediate downside pressures and accelerate gains. 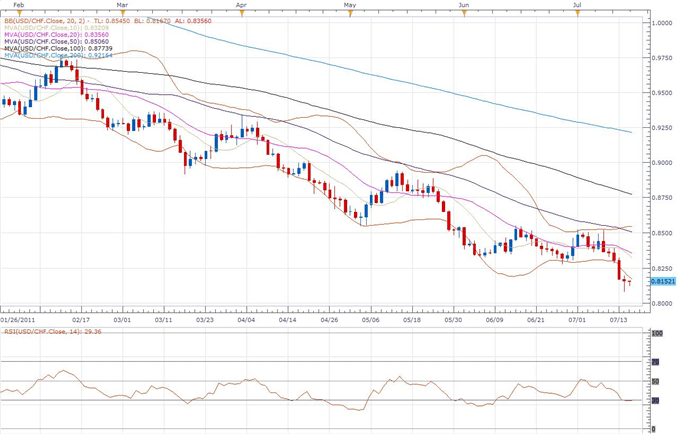 In the interim, look for intraday setbacks to be well supported ahead of 0.8350. The opening trading day to the week was an unusual one. On the one hand, we had significant fundamental event risk headed up by the ongoing Greek bailout saga. Alternatively, liquidity conditions were distorted by the absence of US market participation due to the extended Independence Day holiday weekend. The combination of these two atypical developments was a market high on volatility but low on meaningful follow through. This is the type of frustrating mix that draws many traders into what-looks-like appealing trades that never gain traction after posting an initial signal for entry. Looking to the dollar, we can see the full effect of this market-imposed lethargy. Despite the early morning attempt to post its first bullish close in five trading days, the Dow Jones FXCM Dollar Index (ticker = USDollar ) ended Monday in the red. A look across the majors gives us clear representation of this greenback-centered weakness. Gains from the core EURUSD and GBPUSD pairs were measured but well-established in an underlying (though decelerating trend); the safe haven balanced USDJPY and USDCHF pairs were mostly unchanged but still dollar negative; and the yield-tipped NZDUSD was pushing new record highs into the beginning of Tuesday’s session. Much of the currency’s weakness for the opening session can be chalked up to the carryover of selling momentum from the previous week. When there are is a lull in liquidity; the ability to generate a new trend is exceptionally handicapped – especially when the prevailing winds are generally backing a larger selling effort. Essentially, we should look at Monday as a write-off. Assumptions of trend, breakouts and fundamental shifts should be overlooked as they don’t reflect the conviction of the broader markets. If that is the case, we can approach Tuesday’s session as the opening trading day for the dollar. If that is the case, we can draw forward the prominent fundamental considerations that would will determine the benchmark’s bearing through the rest of the week. Risk appetite trends are still but follow through decelerated between the Asian and European sessions Monday; and it is likely to carry this breaking effort into today’s session. Risk trends are a considerable burden for the dollar when they are positive; but they have offered limited support when negative. This speaks to an underlying truth of the greenback: that the currency is not a pure safe haven but rather a source of liquidity when funding markets freeze up. That being the case, we note that with the passage of Greece’s fifth round of financial support from the European Union, we have temporarily alleviated the threat of a global crisis. In turn, the credit markets have improved and the greenback’s primary appeal has diminished. The European-based sovereign debt issue is still the most immediate threat; but it will be supplanted through the immediate future the approach of the ECB rate decision. This will take a lot of wind out of any offensive that the dollar tries to mount on risk trend from now until Thursday. Another projected outcome was confirmed for euro traders over the weekend; and the support it is offering the currency is visibly wearing thin. After Greek Prime Minister George Papandreou won the confidence vote, it was heavily expected that the country would pass through its additional 78 billion euro austerity measures and secure the fifth tranche of its first bailout package. Indeed, EU Finance Ministers voted this past weekend to release the additional 12 billion in aid (provided the IMF distributes its own portion – which it is expected to approve this Friday). However, from here, the outlook grows a little blurry. Next Monday, the topic of a supplementary bailout package will come up again. In the meantime, Standard & Poor’s threatens to disrupt the quick-fix regime by repeating it would still see a private Greek debt rollover as a default. 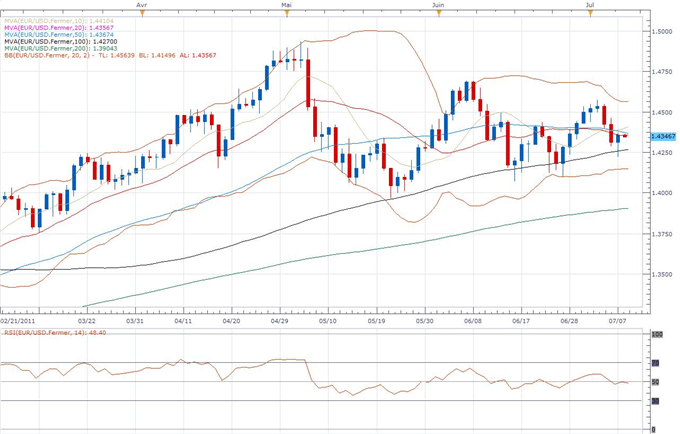 Despite a buoyant start to the week for investor sentiment, the Australian dollar would close Monday out with its first bearish print in five trading days. Considering this weakness was particularly prevalent on AUDNZD, it was clear that the first sub-3.0 percent reading on the TD inflation reading in 11 months along with weak retail sales and approvals weighed the currency specifically. This sets up a dangerous RBA letdown . This week is heavy for UK-based scheduled event risk ; but Monday started us out with something of a mix. The economy’s housing sector took another step back with a weaker-than-expected construction sector reading and ongoing 5.8 billion sterling deficit on housing equity withdrawal. Both indicators are indicative of an important sector that will add additional weight to austerity measures and future stimulus/ratings issues. The franc is quickly retreating against most of its most liquid counterparts – but is this reason enough to call a top? To determine whether the Swiss currency is indeed retreating from its record or near-record highs requires a fundamental position change. The unit is now finding much of its selling pressure through a reversal in safe haven flows from central Europe to the banking economy; but that in itself is not yet a stable driver. Economic indicators have limited impact on the yen; and even major swings in growth potential seem to leave the currency little fazed. The real concern is changes to its place as a funding currency. Monday morning, the BoJ upgraded its growth outlook slightly while Finance Minister Noda suggested the government was backing off some of the pressure for further stimulus. These developments modestly diminish that role. If were just a move posted against the dollar, then we could ascribe gold’s advance Monday to thin markets and a speculative effort to curb bearish speculation through the end of last week. However, the metal posted gains across the board. Fundamentally, confidence in fiat currency has not truly gained much traction. More interesting: net speculative futures positioning dropped last week the most since September 2008. The information contained herein is derived from sources we believe to be reliable, but of which we have not independently verified. Forex Capital Markets, L.L.C.® assumes no responsibility for errors, inaccuracies or omissions in these materials, nor shall it be liable for damages arising out of any person’s reliance upon this information. Forex Capital Markets, L.L.C.® does not warrant the accuracy or completeness of the information, text, graphics, links or other items contained within these materials. Forex Capital Markets, L.L.C.® shall not be liable for any special, indirect, incidental, or consequential damages, including without limitation losses, lost revenues, or lost profits that may result from these materials. Opinions and estimates constitute our judgment and are subject to change without notice. Past performance is not indicative of future results. DailyFX provides forex news on the economic reports and political events that influence the currency market. With risk appetite returning to markets in full force this week, significant gains in equities coupled with the end of the dollar diluting Fed easing policies are likely to see gold remain on the defensive. 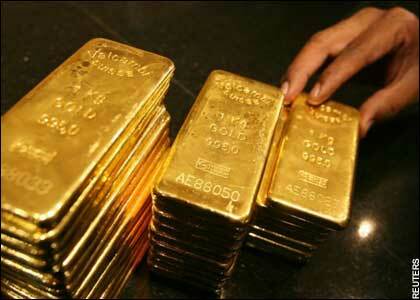 This week witnessed gold fall 1.17% on the back of the 2.36% drop seen the previous week. The yellow metal now approaches key support at the 100-day moving average at $1475. Gold’s inability to climb amid weakness in the dollar may be a pre-curser to further losses moving forward. The Dow Jones FXCM Dollar Index (Ticker: USDollar ) declined more than 1.7% this week as improving risk appetite saw traders jettison the greenback for higher-yielding growth-linked assets. Yet the losses in the dollar and advances in the S&P did not translate into gains for gold, suggesting that there may be a fundamental shift away from the metal as an alternate investment. The breakdown of these key correlations continues to suggest gold me be in a technical correction as traders continue seek riskier assets. 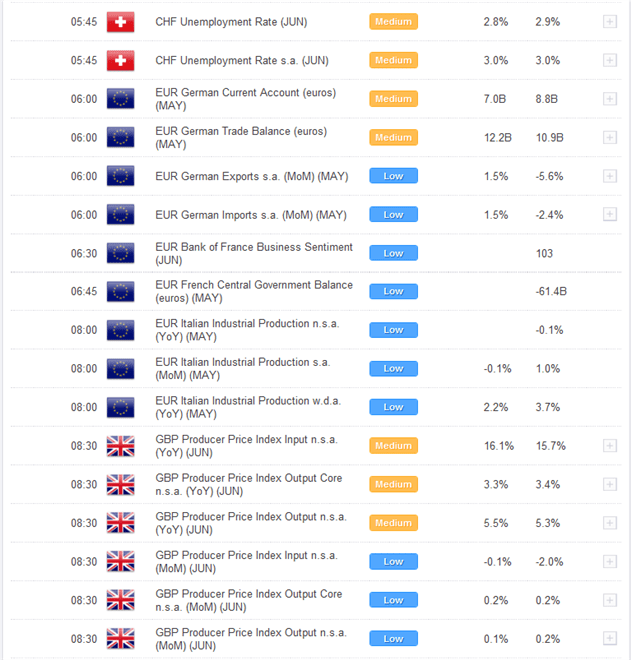 With central banks like the ECB now gearing up to raise interest rates in an attempt to combat higher food and energy costs, the long gold anti-inflationary play will begin to lose its luster as sluggish wage growth and higher rates give rise to deflationary concerns. As appetite continues to pick up, gold becomes less of an attractive asset for traders seeking to maximize exposure to higher yielding investments. However in light of the recent rally seen in equities, one would expect some consolidation ahead of next week’s jam packed global economic docket with rate decisions from the ECB, BOE, and the RBA on tap. The week closes with Friday’s highly anticipated non-farm payroll figures with estimates calling for a read of just 100K after last month’s dismal print of just 54K. If data next week upsets the recent shift in risk sentiment, gold could pair some of the losses seen this week as traders flock to haven assets. However, with central banks moving to curb inflation and interest rates seen on the rise, the metal should remain well anchored with risk weighted to the downside. Tiga mata uang utama berada dalam posisi rentan koreksi. Masing-masing mata uang memiliki ‘beban’ yang bisa memicu penurunan kurs. Demikian pandangan seorang dealer di sebuah lembaga keuangan Jepang. “Hanya soal waktu, (valuta) mana yang anjlok terlebih dahulu,” ujar dealer tersebut. ‘Beban’ yang dimiliki oleh yen tidak lain adalah downgrade rating JGB. Sementara USD masih terbebani oleh plafon hutang dan anggaran Amerika Serikat (AS). Adapun faktor yang bisa menggerus euro tentu berasal dari perkembangan isu hutang Yunani. Saat ini, dollar masih jadi valuta terkuat dibanding kedua rivalnya tersebut karena pesimisme pertumbuhan ekonomi mulai berkurang. Kemudian diikuti oleh EUR, terutama setelah titik terang penyelesaian hutang tampak di Athena. JPY sedang terbebani oleh hasil survei Tankan kuartal II yang dirilis mengecewakan. Sebagai catatan, permintaan eksportir terhadap yen sedang melemah pasca pembelian rutin di akhir bulan.